While many lost pups may end up at a rehabilitation center, rescuers in this case decided that the baby was healthy enough to try a reunion and began searching for its mother. To try to find her, they had to ask around by going around the bay and testing reactions to the pup’s cries from other adults in the hope they would get a response. Finally, after searching roughly a mile of the bay, they did and the two were reunited. He knew the pup would be just fine with a gentle toss. Sea otter pups physically can’t sink… even if you held one underwater it would just going BOING back to the surface… so he knew it would be ok in the water. He needed to put distance between the boat and the mother-pup pair so the mom would come get the pup. She wasn’t going to get the pup if it was too close to, or on, the boat. For southern sea otters, another happy and healthy baby doing well in the wild is especially good news. They were once abundant along the west coast, but were nearly eradicated for the fur trade by the early 1900s, and were also once believed to be extinct in California. 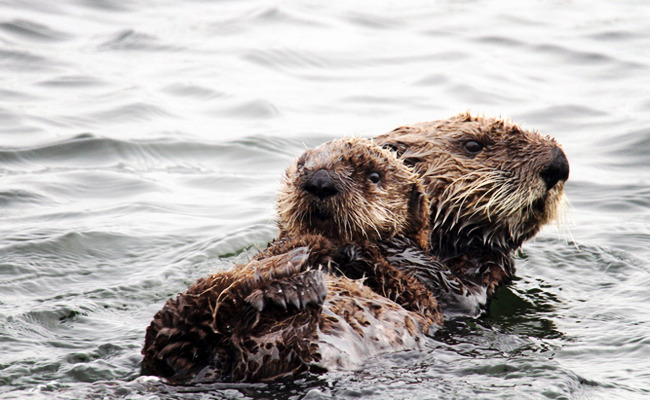 Today, they’re listed as Endangered on the IUCN Red List of Threatened Species, and California’s population of southern sea otters are protected as a threatened species under the Endangered Species Act. Although it’s been a slow recovery for them, their numbers have been growing over the years and will hopefully continue to grow, not just because they’re adorable, but because they’re also a keystone species who are vital to keeping marine ecosystems healthy. For more info on the work being done to help marine mammals, check out The Marine Mammal Center.